I’ve got complaints that I didn’t have any pictures in my previous post. So I will put one from now on. But remember that this post is not about MS PROJECT, it is about Project Management, and there is be no pictures, or graphs. Only text about my experience. Today I will tell you what problems are Project Managers facing with Salesman and Company Owner! Salesman has one task, and one task only. To sell! They will have bonus from each sell or if they reach they target at the end of the year, or the end of the month. If they do not reach their target they will be fired. As simple as that. Company Owner has one main concern! Company growing. It means that he is concerned about revenue, about costs, and about margins. Project Manager has one task. To Manage Project in the way that it can be successful. That mean that he should have enough time, and enough resources, and money to fulfill all Tasks. And those Tasks should be clarified upfront if we are talking about Fixed Price contract. Now, Salesman does not care if something is real or not. In most cases he simple does not! He want to sell the Project as soon as possible for the highest price. And that means that he does not have enough time or patient to gather all the information from the Client, future Project Manager, and Project Team. And that is why is scope almost always unclear. 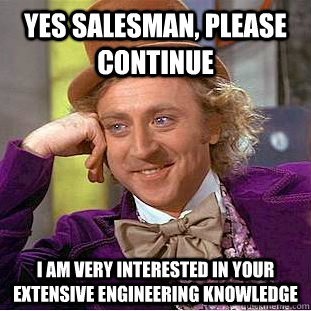 And, I face it all the time, if Customer want something to be done at certain time period, Salesman will promise that. But this is not all! If he knows that he can sell, for example 2.000 hours, and for fulfilling the Project, Teams need, for example, 3.000 hours, he will still sell those 2.000 hours, no matter what Project Manager or Team thinks. Why? Because, after he finish the selling process, he is “good guy”, and when trouble surface because of lack of time, PM is always here to be blamed. On the other hand, Company Owner want’s to have great margin, which means that he wants that Project finish as soon as possible with lowest costs. And yes, he wants that, for example, one developer work on multiple Projects at the same time, so the costs are low. Project Manager very often get a Project to Manage, when the deal is done, e.g. Contract is signed. And then he or she is responsible to fulfill all demands which are in contract. BUT! First he/she and the team has to make a, so called, deep analysis. I found myself, almost always in a situation like this. Salesman or/and Company Owners say: “We do not have time to make deep analysis, because we have to sign the contract ASAP! After it will be signed we will have time to make deep analysis” BUT! Even if you, as a Project Manager, have opportunity to make this deep analysis, the question is: “What will you have as a result of this analysis?”. And the answer is: “You will find out that you need more things to do then it was in a contract, you need more time, more people, and more money!” And you will not get it! At least you will get some of this but not all of these. And you are responsible for Project success. Let’s face it! There is no standard, or procedure, or tool, which can solve this situation! That is what Project Managers are facing all the time. No matter how much experience do they have. And that is real life. This entry was posted in PRoject Management and tagged Company owner, Salesman. Bookmark the permalink.